Imagine you submit for Google Places / Local verification for your business on Google Maps. Imagine that when the postcard Google mails to you with a special verification comes but is blank. Yes, many people trying to verify their businesses with Google Maps receive a postcard from Google, but the code to enter onto Google Places for verification is empty. 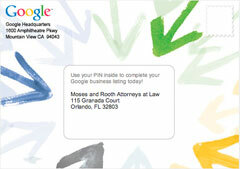 Trying to verify a business listing and keep getting the google card in the mail with no code on it. The area where the code should be is blank. This has happened three times now. I assumed it was a printing issue, but apparently it is not. I have already submitted a support ticket, but have gotten no response from google. Anyone have any insight on this? Thanks for reporting -- we're still looking into it. Citing this as an example. Thanks, Linda, for the heads up.